The election was won by identity politics. Black people voted for President Obama by over 93%, Hispanics 71% and Asians 73%. The exit polls show 55% of women voted for Obama, whereas 59% of white people voted for Romney. Ninety percent who thought the economy is good voted for Obama. Those who thought it is not so good voted for Romney by 60% margins. Why Romney lost so big is a topic really outside our purview, yet we'll put in our 2¢ that it might be due to campaign rhetoric on policies promised. Unfortunately, there are words and there are deeds. 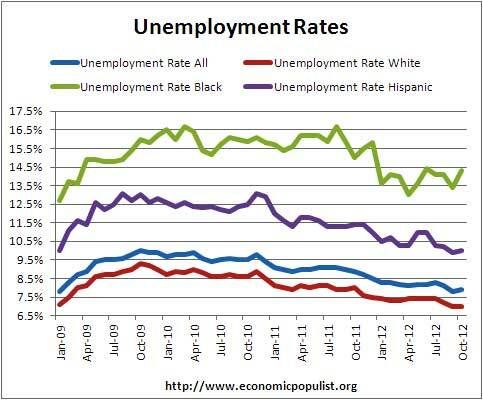 What has the Obama administration done economically for the demographic groups who gave President Obama a second term? 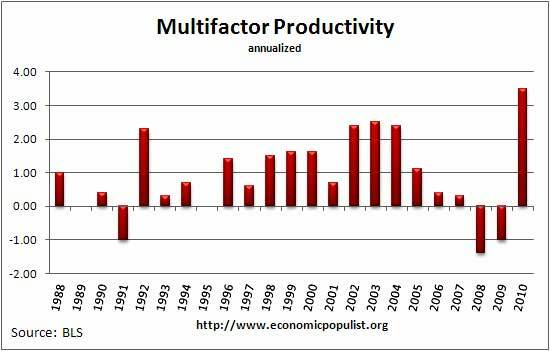 Multifactor Productivity Increased 3.5% in 2010, Really? Multifactor productivity for the private business sector excluding farms had the largest increase in the history of record keeping for 2010. So states the BLS in their report. Read more about Multifactor Productivity Increased 3.5% in 2010, Really? We've heard many a great speech from President Obama before. Last night's State of the Union was no exception. Here at The Economic Populist we say show me the money. We've heard soaring rhetoric from President Obama too many times, yet behind the words, deeds are either opposite or M.I.A. Still, Obama gave a lot of lip service to U.S. manufacturing and jobs. To even get U.S. manufacturing on the national policy radar is a feat in and of itself. The actual SOTU transcript is on the White House site with a flurry of videos, social media and round tables to boot. Can't say this administration suffers from a lack of word generation! That said, we all take President Obama at this point with a strong grain of salt. We've been so disappointed already. Kudos to him for continuing to highlight this important issue, but he failed to mention the main cause of our manufacturing woes in the first place: currency manipulation. About the only thing Populist Progressive Democrat Congressman Peter DeFazio can say about Obama these days is it could have been worse. Long slide down from the irrational exuberance of 2008.